The Food: Salmon Teriyaki with Glass Noodle Salad. 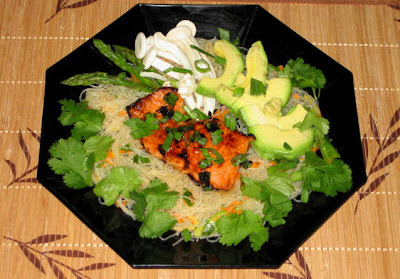 Salmon Teriyaki with Glass Noodle Salad. This is such a nice, fast summer dish. Once the glass noodles (mung bean noodle) are soaked it is just a matter of minutes to assemble, cook and serve. The taste and texture of room temperature noodle salad and hot salmon is incredible. This dish is great any time of a year but it shines in summer months. Soak noodles in warm water for 1/2 hour, drain and cut with scissors to 4” long strands. Boil water in a pot, drop noodles in and 5 seconds later drain in a strainer and run under cold water to stop cooking process. Drain again and reserve in a large mixing bowl. In a skillet heat 1 tsp. of peanut oil and 1/2 tsp. of sesame oil and stir fry the ginger, asparagus stems and white parts of scallions till soft. Turn the heat and stir in carrots. Remove all contents from skillet into a bowl with noodles and mix. In a bowl mix all dressing ingredients, pour over noodles and mix till well combined. Serve noodles on individual plates. Heat up same skillet with another 1 tsp. peanut oil and 1/2 tsp. sesame oil and when oil starts to smoke add salmon skin side down (skin side is flat) and cook till browned, about 2 minutes. Turn over and cook for 2 minutes. Add teriyaki sauce and asparagus spears and cook till sauce has thickened and fish starts to flake. Do not over cook! Remove salmon and asparagus and place on top of noodles. Garnish with avocado slices, Enokitake mushrooms and green onions.